Max is a wood turner and retired school teacher and has worked with wood for most of his life. Max started to turn wood on his lathe 18 years ago as a hobby; now turning is his passion. His work can be seen in several art galleries in Bloomington (including the Blue Heron Gallery) and Nashville, In (https://www.hoosierartist.net/max-monts.). Jon is an accomplished designer and woodworker with 28 years of experience. He and his life partner Patricia create expertly crafted wooden boxes that are transformed with graphic images and phrases to create beautifulworks of art. Their works are reminiscent of tattoos on wood, thus their business name TattooDreams. Michael has been woodburning since he was 8 years old. He learned from his Grandfather who taught him how to make extra money by woodburning house numbers for people in his community. He loves this traditional art form and continues to search for new technique to increase his skill. Michael began furniture making after receiving a BFA in Sculpture from Indiana University in 1976. He first worked for local furniture maker Paul Caudell where he learned the basics of woodworking. After working for Paul, he began designing and building custom furniture for Bear Creek Designs, one of the three original owners of Trilogy Gallery in Nashville, IN. In 1979 Michael opened his own business building custom residential and commercial furniture and cabinetry for the local and regional markets. In 2015 Michael opened Blue Heron Woodworking Supplies. After receiving requests for classes from many of his customers, the Blue Heron School of Woodworking was started in January of 2018. Larry Barber has been a woodworker for 70 years, He did a part time apprentice with Ora Ward making cathedral radio cases in the 1950s. In the 1960s Larry worked in the I.U. Psychology Shop building custom psychology experimental apparatus and equipment. In the 1970s he took creative wood working classes at the Oregon Wood Working Academy and studied with James Krenov. From 1975 until 1995 he was a partner in a Fly Fishing Guiding and River Running business in Montana. In that capacity he built many Fly Rods and studied Fly Rod construction with Fuss Peak and Harry Wilson of Scott Rods. Larry has taught dozens of Fly Rod construction and Fly Tying classes. In the 1980s he established his own shop business called "Wood and Woven" and built custom Shaker design furniture for 30 years, (over 300 pieces). Larry is also a gunsmith making stocks for firearms, a knife smith, and a Hunter safety instructor for the D.N.R..
Don first learned to use the wood lathe in high school. After spending a career in federal law enforcement he retired in 2008 and took up the lathe as a passion. He lives in Monroe County, IN and has three wood lathes in his shop. Although he specializes in spindle turnings ( ink pens, bottle stoppers, candle holders, goblets, etc. ), he also enjoys turning bowls and platters. He has sold his work at various art fairs, but he likes making items for his wife, friends, and relatives. Don helped to start the Village Woodturners, a turning club that serves the south-central Indiana area, and currently serves as the club’s president. 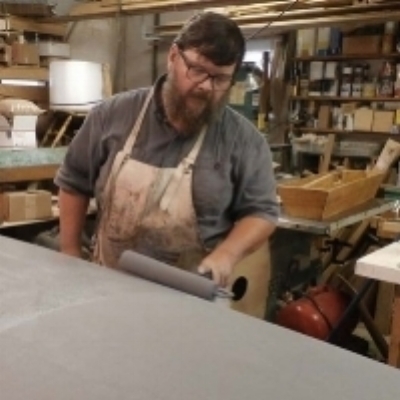 Duncan grew up 18 miles outside of Bloomington, IN, spending much of his youth and young adult years assisting his father in his woodworking business. After spending several years away from woodworking he found a passion in green woodworking. Being still fairly new to this this area of woodworking Duncan is still learning and honing his craft.